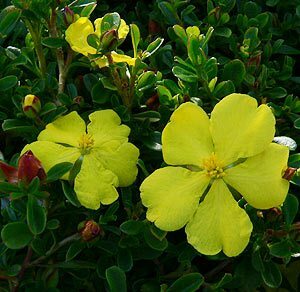 Hibbertia are perennial shrubs or climbing plants well suited to the garden. Most Hibbertia are native to Australia and with over 100 species the variety available is large. A group of shrubs ranging from low growing prostrate forms to medium shrubs reaching around 1m in height, with a few scrambling or climbing types thrown in this is a diverse group of plants. Hibbertia are found along the eastern coastline of New South Wales and Queensland, in Victoria and Tasmania with some species such as Hibbertia stellari also being found in Western Australia. H. humifusa, pictured right is known as the Guinea Flower and is found in central Victoria. H. obtusifolia comes as a prostrate form as well as an upright form and makes a good ground cover plant, pictured below right. All species have pretty yellow flowers and generally require a well drained humus rich soil. 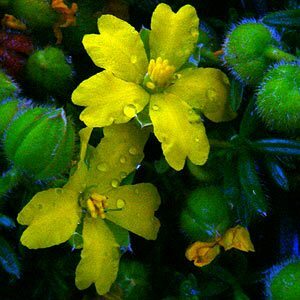 Hibbertia forms include small shrubs and climbing or trailing plants. H.scandens is used as a ground cover plant, it forms a dense mat of foliage and will scramble its way over logs, fences and other plants if allowed. Like most species it flowers from spring through to summer. Propagation is usually from seed, however the seed itself if difficult to collect. A number of species are readily available at nurseries and these include H.cuneformis, H. obtusifolia and H.stellaris, an interesting form and somewhat difficult to grow species, with orange flowers that is often grown as an annual. H. dentata which flowers over a lengthy period makes a nice climbing or trailing plant. H. grossulariifolia because of its foliage is called ‘ Gooseberry-leaved guinea flower’.